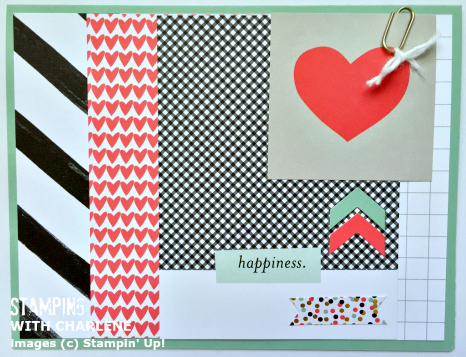 Home » Greeting Cards » Beautiful New 2015-2017 In-Colors from Stampin’ Up! 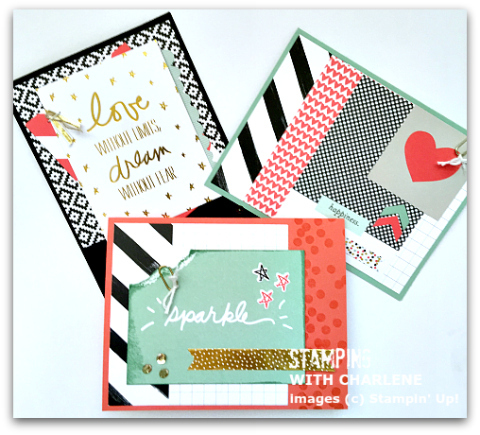 Beautiful New 2015-2017 In-Colors from Stampin’ Up! Happiness is what I think and feel when I look at this card and all of the wonderful colors and shapes. 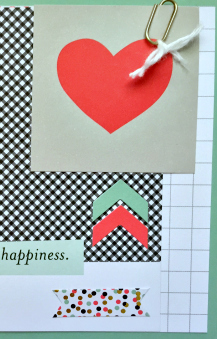 I created the layers on this card with pieces from the Moments Like These Project Life Card Collection by Stampin’ Up! I also used accessories from the Moments Like These Project Life Accessory Pack to add some flair. Aren’t the colors delicious to look at? The names are yummy, too. This card uses Watermelon Wonder (hello, summers by the pool!) Mint Macaron (cookies, please!) and Tip Top Taupe, which reminds me of cookie dough. When you order the new 2015-2017 In-Colors, be sure to add Basic Black cardstock and Gold Foil Sheets to your order. Look at the luxurious feeling that those two colors add when they are combined with Mint Macaron, Watermelon Wonder, Tip Top Taupe and Whisper White. Ooh, la-la! It is going to be a fun couple of years making cards and projects with these beautiful new colors. Don’t forget about this week’s Weekly Deals! Take a look below and visit my Demonstrator Website to order. ← Watermelon Wonder is Wondrous!